Recreational and commercial blue crab traps in state waters from the Pasco-Hernando county line to the Wakulla-Franklin county line, including all waters of the Ochlockonee River and Bay, must be removed from the water before July 20, the first day of a 10-day trap closure. This closure will give groups authorized by the Florida Fish and Wildlife Conservation Commission (FWC) the opportunity to identify and retrieve lost and abandoned blue crab traps from the water. Traps can be placed back in the water in this area starting July 30. Until then, blue crabs may be harvested with other gear, such as dip nets and fold-up traps. Blue crab harvesters may also use standard blue crab traps during the closure if the traps are attached to a dock or other private property. 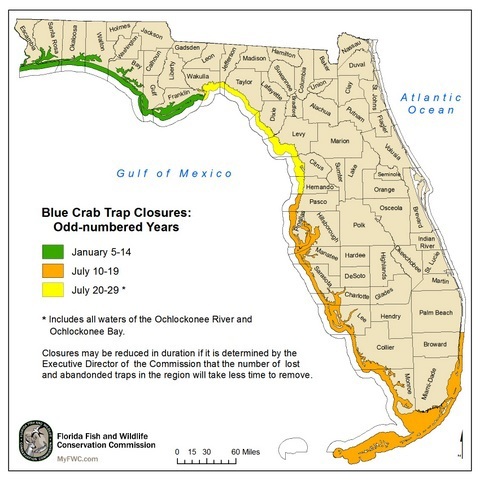 The closure is one of three regional, 10-day blue crab trap closures that occur in 2015 on the Gulf coast of Florida. There are six regional closures total: three in even-numbered years on the east coast and three in odd-numbered years on the west coast. While state waters extend to 9 nautical miles offshore in the Gulf, blue crab trap closures include only state waters extending to 3 nautical miles offshore. More information regarding the FWC’s trap-retrieval program, blue crab trap closure dates, regulations and cleanup events is available online at MyFWC.com/Fishing (click on “Saltwater Fishing” then “Trap Retrieval/Debris Removal”). For additional information, contact the FWC’s trap retrieval coordinator, Kyle Miller, at 850-487-0554.